The Children’s Center of Lake Forest has TWO infant rooms, a young infant room and an older infant room. When babies start crawling and become more mobile, we move them to the older infant room where they have a separated play area and more age appropriate toys to help them develop their large muscles. We maintain and encourage close communication daily so as to assure that every baby receives the best care. So as to better prepare our infants for language development, our teachers read books, Sing songs and do fingerplays. We understand that at this very young stage they need to feel Secure so we try to constantly be beside them during playtime. On good temperature days, we take our infants on stroller walks to enjoy nature and the Fresh air. 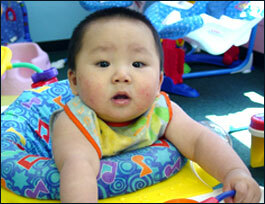 At The Childrens Center of Lake Forest we make our infant classes an extension of home. Our caring, trained and experienced teachers respect each child’s needs and daily routine from home. A daily report is logged daily to inform parents of the number of feedings, amount, diaper changing and daily activities. Parents are welcomed to visit their baby any time of the day. For parents trust, comfort and good peace of mind while at work, we invite parents at no cost to spend time in their child’s room to get better acquainted with the teachers and the environment that their child will be in. This helps parents go back to work being reassured that their baby is safe and happy. Parents provide their infants with formula, bottles and jar food. When infants transition to whole milk, we provide it along with table food unless parent chooses to provide. Young infants are helped to develop their back and neck support by alternating activites such as tummy time, exersaucer, sitting up during appropriate times of the day.